I’ve encountered author Jeff Strand a number of times previously during my roams through the Horror genre, and always come away from his stories feeling horrified, creeped out and more than a little guilty for laughing as much as I did given the usually extremely disquieting nature of the scenarios that play out in his short stories. My latest encounter prior to this had been his contribution to Crystal Lake Publishing’s excellent Welcome to the Show horror anthology; his short story, Parody, had been one of the highlights of the anthology, a delightfully twisted story of a tale of a musician trying to break into the music circuit at a famous music club by performing some distinctly unique musical parodies. It was fast-paced, deftly written, at times even disorientating, and laced with comedy so black that no light could escape its surface that all combined to an ending I absolutely wasn’t expecting and which genuinely shocked me. Therefore, when I happened to notice on Twitter that Mr Strand was advertising his latest publication, the novelette Cold Dead Hands, I decided that I absolutely needed to take a look. Not only did it have the bargain-basement price of a measly 99p/99c as it had just been released, but it was also only 73 pages long, and therefore seemed like the sort of short, sharp horror read that I needed to refresh my palette in between my forays into the dregs of the alternate history genre to try and uncover the odd jewel in amongst the pot-boilers. The triangulation of title, cover image and cover blurb came together to entice me. The title intimated sub-zero temperature horror, which I’ve always had a fondness for ever since watching Horror classic The Thing, and the cover image by illustrator Lynne Hansen was both impressive and evocative; a sturdy and ice-covered freezer-type door, while the title font cleverly included a pistol in place of the ‘L’ in ‘Cold’ which further intrigued me. Finally, the back cover blurb baited me with the story of a grocery store being attacked by a band of maniacs, and the survivors desperately eking out their time in the freezer, battling the cold inside and their attackers outside. It was certainly a scenario that I hadn’t come across before, and honestly couldn’t even imagine coming up with, and it seemed to be pregnant with so many possibilities for Strand’s unique brand of dark-humoured and intense horror writing that I couldn’t wait to get stuck in and reading. The novella starts with an engaging in media-res opening, with a small group of shoppers frantically barricading themselves into a walk-in freezer to escape being killed by a group of seemingly-insane people who have attacked the shop they were visiting early one morning. The attackers don’t appear to be the ‘usual’ kind who would rob a store – one slashes protagonist Barry’s arm with a broken bottle, and another tries to shoot someone with an arrow. That’s the first indication Strand gives the reader that perhaps this isn’t your typical ‘armed robbery/hostage situation gone wrong’ story. It’s a rather unique situation to throw a bunch of characters into, and kudos to Strand for coming up with something that is simultaneously so realistic and yet has so much potential for a horror-based scenario. He does a good job of developing the personalities and characteristics of all of the characters inside the freezer without making it too obvious that many of them aren’t likely to survive to the end of the story. He also ratchets up the tension nicely as the escapees begin to feel the effects of the temperature, and there’s no progress with the police subduing the attackers and releasing them. Not only is the temperature decreasing, and various nasty effects setting in, but tempers and group-based paranoia only increase, especially when one of the characters is identified by Internet reports as potentially being one of the attackers. Here we see Strand’s innate understanding of how to develop a plot through character development and the complex psychology of group interactions, with some wanting to kill the alleged attacker immediately, others wanting to use him as a negotiating tactic, and some just staying out of the way completely and refusing to engage. By this point in the narrative it has all of the hallmarks of a classic and skilfully-written piece of human-based horror – the fallibility of people put into a high-stress and potentially fatal situation, turning on one another based on the flimsiest of evidence. It becomes a fascinating piece of fiction to read as the story progresses, and Strand gleefully throws in one problem after another for the characters to try and cope with, with increasingly bloody results; I quickly found myself captivated by the story, and actually finished it in one long read that only ended about midnight. By far the best element to be found in Cold Dead Hands, as well as the most entertaining, is the dialogue that Strand writes. It flows so well and so slickly, making the narrative move forward with a minimum of fuss – although most of the plot points are provided in narrative form, never once does it come across as unwieldy or info-dumping. It’s also funny as hell, especially when protagonist Barry is forced to trade quips and threatening remarks with one of the grocery store attackers. Indeed, so well written is the dialogue, and the novella in general, that I find myself with no option but to deploy that old hoary cliché – it is genuinely cinematic in tone and direction, and seems eminently suited for turning into a short film along the terms of something like that subversive dark comedy, The Belko Experiment. Strand also combines the inherent drama of this hostage situation with an injection of his trademark pitch-black humour, which of course I’ve come to expect from Mr Strand based on his work that I’ve come across. As this is a relatively short title I’m not going to spoil any of the plot points, but suffice to say that the motivations of the attackers are very much a contemporary political issue, which Strand injects with some cutting satirical humour to make some pointed observations about the attackers hypocrisy in their alleged motives. There’s also a certain detached, almost wry comedy to be found in the way that the group deal with some dead bodies, which Strand writes in a particularly subtle and dead-pan way that I found myself smirking unconsciously despite the inappropriate nature of the scenario that unfolds. There’s something of a delay in the gore that I also expected to encounter, and for quite a few pages it’s just a relatively restrained amount of stabbing and the odd shooting; but when the real blood and guts stuff suddenly erupts, rather unexpectedly, it’s both distinctly disconcerting and gut-wrenching stuff, with Strand not pulling any punches in describing the effects of the weapons that these attackers use during the hostage situation. I genuinely winced when a bomb goes off (I’ll refrain from further spoilers) and had to put my Kindle down for a moment to recover after reading the rather matter-of-fact description of the injuries that the blast results in. Strand also doesn’t shy away from further descriptions of bloodshed, shattered limbs and broken corpses, including an incident with an injured child that honestly had me putting the Kindle down for a while to recover, such was Strand’s skill as a writer in pulling me into the scene and imagining it in all-too vivid detail. Cold Dead Hands is quite a short piece of horror fiction, which as I referenced earlier, I was able to finish in a single sitting over the course of a few hours. But while it may be short, it’s an absolutely first-rate slice of horror that packs in a lot of physical and psychological terror into its relatively small word-count, with no wasted chapters, pages or even paragraphs. It’s a laser-focused study of human character, behaviour and frailties when placed under the most intense pressure possible outside of the military, and it doesn’t stumble once in achieving what Strand set out to do. 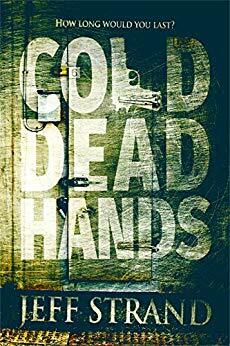 Superbly written, well-paced and with some real cutting-edge humour and satire mixed in with slow-burn tension and a bloody finale, Cold Dead Hands is a must-have addition to any horror fan’s collection. I’m intrigued. I like a well written, tight short story, particularly when it comes to horror. Good dialogue is an even further plus.